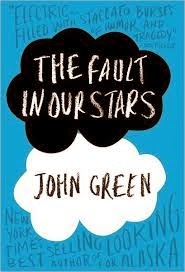 I honestly do not think there are enough words to express how much this particular book, "The Fault in our Stars" by John Green moved me. Unlike anything that is complicated or fanatical, it is the simplicity and emotional clutch attached with the story that is the most appealing. A love story between a boy and girl with a twist; classic plot base but there is something more within the lines. It does not preach the saying 'Love conquers all' to a huge extent and instead showcases the fact that sometimes even love cannot overwrite what has already been decided and that we have to accept situations the way they are. The world that is created isn't anything out of the ordinary, in fact, quite the opposite. Filled with joyous and heartbreaking events, it is definitely the kind of book that one would enjoy from start to finish. Falling for Augustus Waters seemed totally fine to me at first because frankly, he made me laugh, cry and smile at the same time and I was trapped between the emotions. Added to that was the sarcastic humour portrayed by the characters and in a way, it is something one could relate to. In case any of you are looking for a good read, I recommend this book. The writer is a first year undergraduate student in the School of Media & Communication. Insightful. I've read this incredible book. And indeed there are no words to express how it makes you feel. Crisp,and not too long like usual reviews. I hope to see more,Revathy!